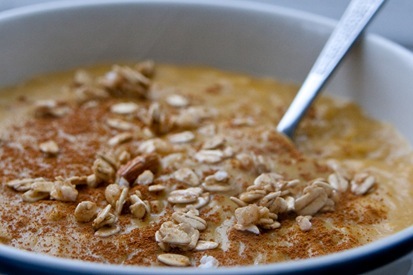 If you like oatmeal + pumpkin you MUST try this recipe. I have started preparing my basic bowl of oatmeal according to Kath’s awesome recipe for whipped banana oats. The only thing I change is that I leave out the salt. I have been using unsweetened rice milk or unsweetened vanilla almond milk instead of regular cow’s milk, but any will work fine. I use organic rolled oats that you can usually find for about $.99/lb in the bulk bins. They take a little longer to cook than the quick oats, about 5+ min on the stovetop, but there is a big difference in texture. From there I added 1/4c. plain pumpkin puree, a dash of nutmeg and a 1/4t. cinnamon, 2t. of either brown sugar/honey/maple syrup/brown rice syrup [any will work, just to add a little sweetness]. I also topped it with vanilla almond granola, for a little crunch. Off to the Great American Beer Festival after the OSU game! Have a great weekend! !